If you’re able to make a cup of coffee while your computer loads it’s probably time for you to update your operating system (OS). Visit http://windows.microsoft.com/en-us/windows-vista/install-windows-updates to learn more about updating your Windows OS. If you’re an Apple aficionado visit https://support.apple.com/downloads/ to view Apple’s latest featured downloads. As always, we recommend you check with your System Administrator before you update an operating system on a company-owned laptop or desktop. Another boon to your system? Multiple programs loading during system startup. Of course, you want a few programs running when you begin your day, however, if you take stock of how you do your work — chances are you’re only using three to four programs in your regular 9 to 5. Work with your System Administrator to remove the startup programs that are bringing you down. Bob in Finance has a fancy print booklet that he has created for an upcoming meeting. You’ve decided that you definitely want to use a similar document in your next sales presentation. You bring up your printer settings and manage to replicate Bob’s masterpiece. “File>print.” But wait, did you save that print configuration for next time? Creating printer presets can save you time and future headaches for your office manager. Another time saving tactic is documenting processes. Just as you would save instructions for baking your favorite cookies, you should document the processes for repetitive office projects. These processes, better known as best practices, will help you save overhead and complete projects more efficiently. Today’s popular process documents include: employee handbooks, social media policies, IT security policies, and more. Consider the projects in your organization that involve teams and document those processes first. This documentation is also crucial in the event of a natural disaster, or employee turnover. And remember, always add a revision date to your documentation and review semi-annually for necessary updates. One of the most popular hindrances to productivity is the project itself. Often a project may appear large in scope and too difficult to complete. You may feel that you need a team to accomplish the project, or you’re not sure how to begin working on the project. Guess what? That’s okay. And most employees feel the way you do when handed something to achieve. The good news? You will finish. So how do you start a large project? Map out the steps to complete your project. What comes first? Do you need a team, or can you achieve the project on your own? What resources do you need? Finally, write down the first task you need to complete for the project, and then the second, and so on. While this process appears to be simple – it will help you gain an understanding of what you need for your project, and how to begin. Now that you’ve begun, you may want some tools to help you focus on your project. Consider using the Pomodoro Technique and spend 25 minutes at a time, on your project, without interruption. You can use this nifty timer tool or just glance at your clock. 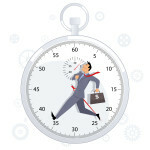 Another great tool is Toggl which allows you to clock in and out of each project. These tools, among others, can help you be accountable for your productivity. Just be sure you’re not aiming all of your focus on finding tools rather than completing your project. As you enter 2016 you can use these tips to enhance your productivity and begin digging through the tasks that have been awarded to you. And remember, you may need additional resources to assist you with your projects. If you find your network needs an upgrade, or your printing and scanning needs are not up to snuff then SymQuest is here to help. Cheers to 2016. And to a productive new you.